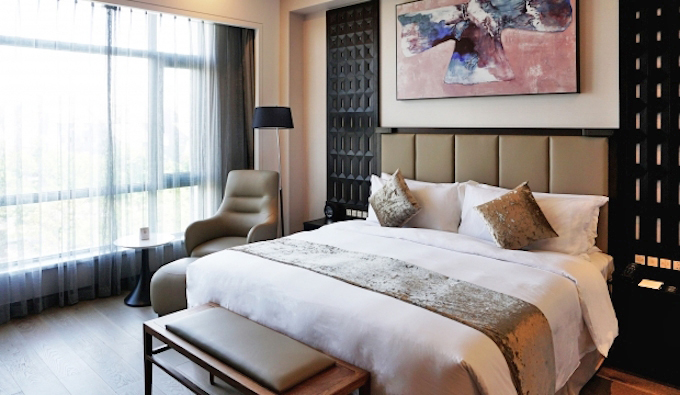 Located a short distance from the National Exhibition and Convention Centre in the west of Shanghai and 10 minutes from Hongqiao Airport, the hotel has a prime location for business travellers combined with exceptional dining and wellness facilities. Meliá Shanghai Hongqiao has 187 luxuriously equipped rooms with sophisticated interior decoration with an Asian flair, as well as the VIP The level service characteristic of the Meliá brand. Three Chinese neoclassical independent villas measuring 400 sq m and with a garden, offer an additional accommodation option accompanied by exclusive services such as a personal butler, private dinners or limousine service. The hotel also provides 700 sq m of space and facilities for events and meetings, a YHI Spa – the wellness sanctuary of the Meliá Hotels & Resorts brand – indoor pool and gym, while the Spanish chef Abel López Reina runs the Merkado Restaurant, combining Mediterranean and Asian cuisine and adding a Spanish touch to the hotel experience. In addition, the Garbo Bar aims to become one of the best cocktail bars in the area.